Most American families wouldn’t dream of celebrating Thanksgiving without a turkey. We usually roast or smoke ours, but with this year’s “Thanksgivukah” celebration– the rare convergence of the Thanksgiving and Hanukkah holidays– deep frying seemed a more fitting way to go. Many traditional Hanukkah foods are fried to symbolize the miracle of the oil in the Holy Temple, so deep frying the turkey seems like a no-brainer. 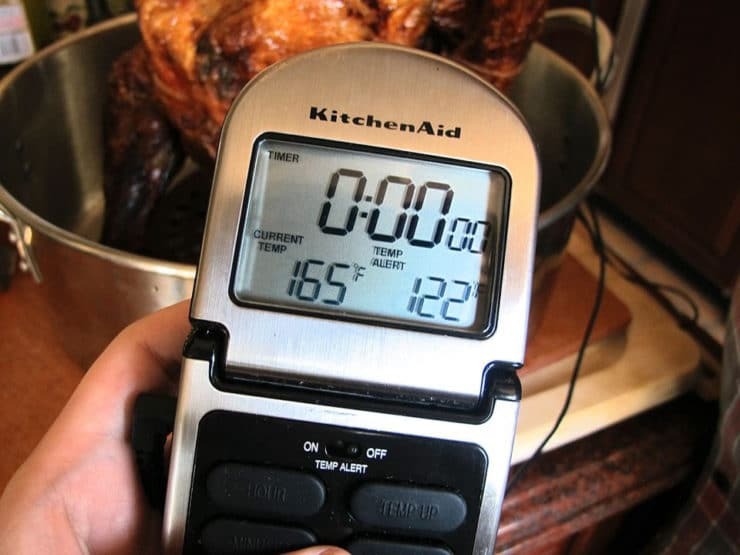 In addition to the obvious symbolism, a turkey can be fried in less than an hour (really! ), giving you more time to spend with your guests. But frying wasn’t enough for me. I find turkey meat pretty boring, even when it’s deep fried. I wanted more flavor out of this holiday centerpiece. Enter sriracha to save the day! This recipe was well tested. I mean, REALLY well tested. We went through 6 turkeys till I got one that I was fully satisfied with. My family ate a lot of turkey this month. I wanted to infuse the turkey with sriracha flavor, but not overwhelm it. It took a few tries to get the right ratio of spice, salt and sweetness in the injectable sriracha marinade. And then, of course, I had to master the art of frying turkey to a perfect doneness. The oil has to be at just the right temperature. The turkey can’t be too big. You need to keep close tabs on the oil heat throughout the process. If you take the turkey out too soon, it won’t come to food safe temperature. If you take it out too late, you’ll suffer from breast meat that is too dry. Lots to think about! The good news is, I’ve made all the mistakes in advance so you can avoid them yourself. I’ve created a detailed step-by-step tutorial here, with photos to illustrate. 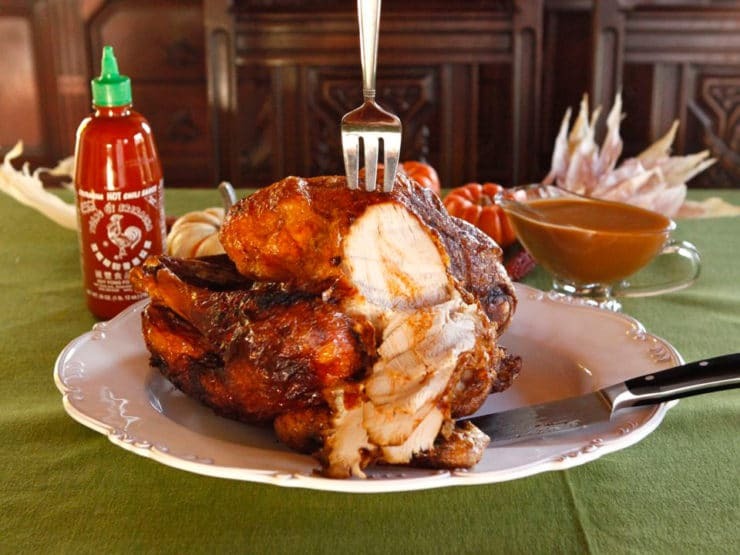 Follow the steps carefully, and you should end up with a turkey that wows your guests… crispy skin, tender moist meat, and amazing flavor (especially if you use the sriracha marinade!). One of the major complaints people have when they fry turkey is that you don’t get any drippings to make gravy. No worries! I’ve got you covered with gravy that can be made a day ahead (thanks for the tip Noble Pig!). I used turkey parts to create a dark, rich stock as a base. Then, of course, I added sriracha. You can make it without sriracha if you want to… but why wouldn’t you? The gravy turned out so delicious, I ate it with a spoon. A lot of it. I’m need some time on the treadmill, STAT. This is, no joke, the best tasting turkey I’ve ever made. Sriracha is spicy, but I’ve kept the infusion flavor fairly mellow, in case any of your guests are spice-sensitive. The gravy has a great kick to it, but you can of course adjust the amount of spice by cutting or increasing the added sriracha. I had friends over (with varying levels of spice sensitivity) when I tested the final product. They couldn’t get enough of it– and that gravy, oh my! Just look at the marbling of sriracha marinade inside that moist breast meat. I’m thinking this might make the best turkey sandwiches in the history of leftovers. Holy moly. P.S. This post is dedicated to The Oatmeal, in honor of our mutual love of sriracha. 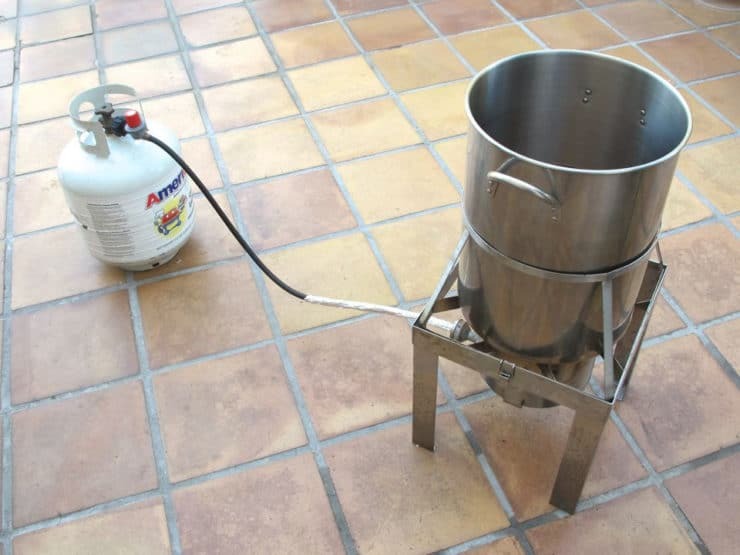 Learn to deep fry a turkey with this step-by-step photo tutorial. Infuse it with sriracha marinade and sriracha gravy for a flavor explosion! Nutrition is calculated on an 11-pound turkey, with 1 pound per person. 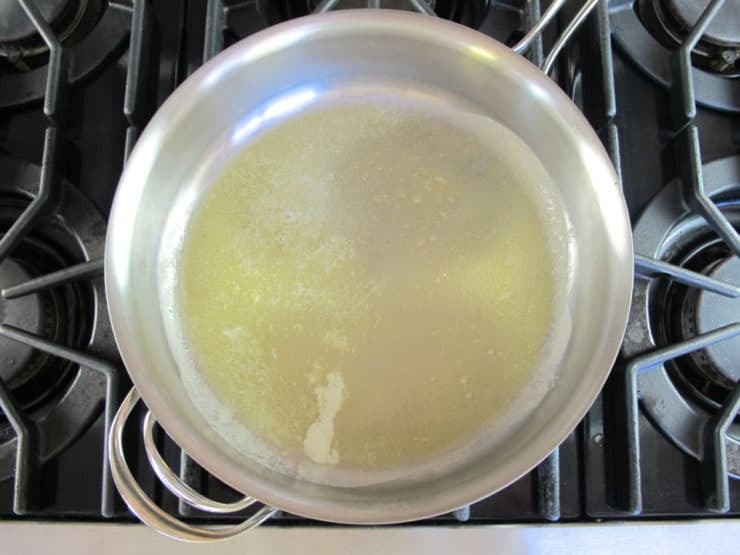 A few notes of caution before you begin: be sure to familiarize yourself with your fryer’s instructions before you get started (each fryer is slightly different). Please take caution and always have a fire extinguisher handy. Never set up your deep fryer indoors, under trees or near children or pets. Frying a turkey can be dangerous if done incorrectly, and can result in a fire if you're not careful. Make sure your turkey is defrosted before you begin the injection process (this will take some planning ahead if your turkey is frozen-- defrosting can take 24-48 hours). Combine injection marinade ingredients in a saucepan and heat just long enough for the dry ingredients to dissolve. Remove from heat. Clean your turkey and remove giblets (if any) and any plastic twine or pop-up plastic thermometers. 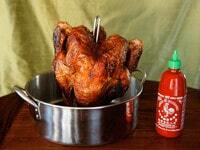 Use an injector to inject the sriracha marinade into the turkey. When injecting a turkey, try to inject small amounts of the liquid in as many areas as possible. You should inject at several differential levels from below the surface to the center of the meat. Try not to insert the injector too far into the meat, to avoid it spilling out the other side, or too close to the skin, which will cause it leak out. Sprinkle the turkey skin all over with salt, then allow the turkey to rest overnight in the refrigerator so that the flavors have time to marinate. 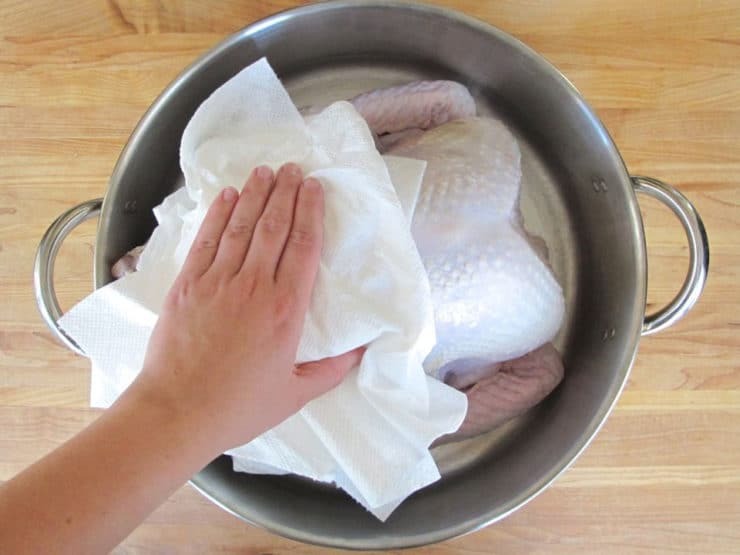 Prepare your turkey for deep frying by first patting it dry with a clean towel or paper towel. Liquid and hot oil don’t mix! 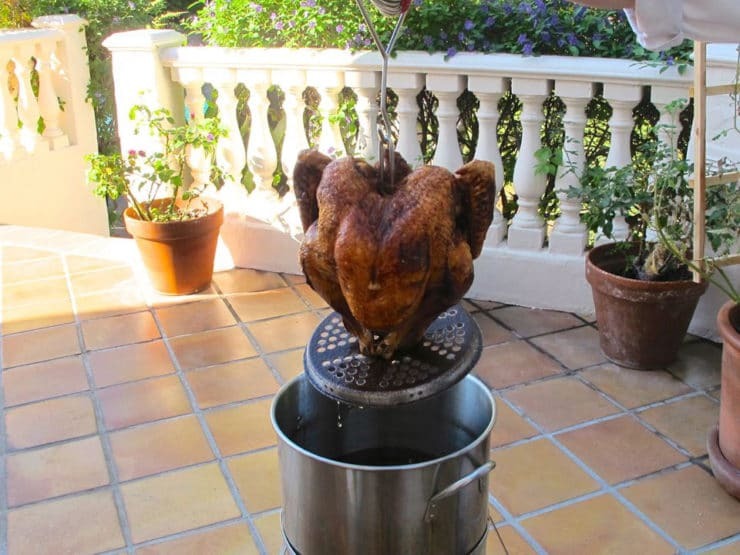 Place the turkey, legs down, onto the poultry rack included with your fryer set-up. Secure and truss with twine if desired. When setting up your fryer, choose a flat outdoor surface free of leaves and debris. The amount of oil you will need can be determined by placing the turkey into the empty deep fryer and covering it with oil. 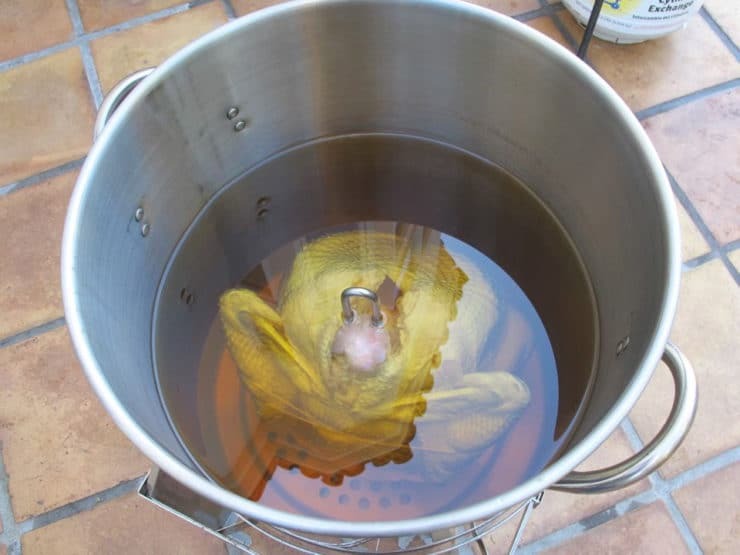 Stop when the turkey is fully submerged, then remove the turkey from the deep fryer. Begin heating your oil. 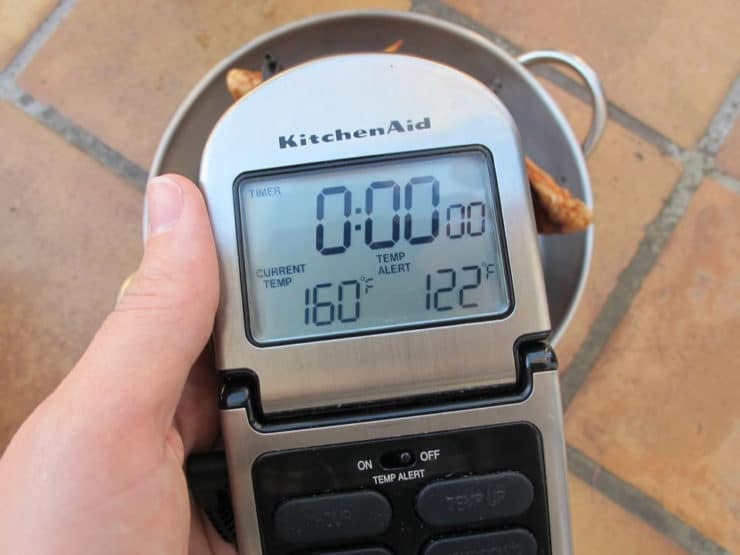 Your deep fryer should come with a probe-style thermometer that fits into a hole on the top of the lid, or clips onto the side of the fryer pot. If not, you will need to purchase one. Monitor the thermometer until the oil reaches 325 degrees. 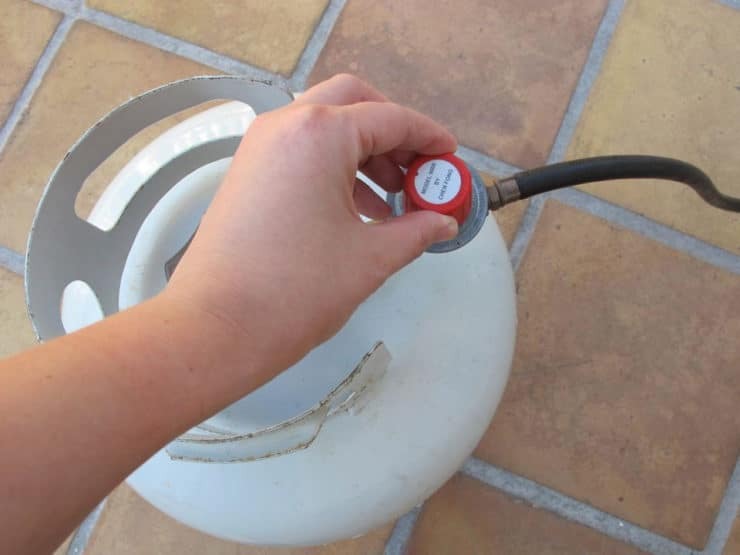 Once your oil has reached 325 degrees, turn off the flame and gas momentarily. 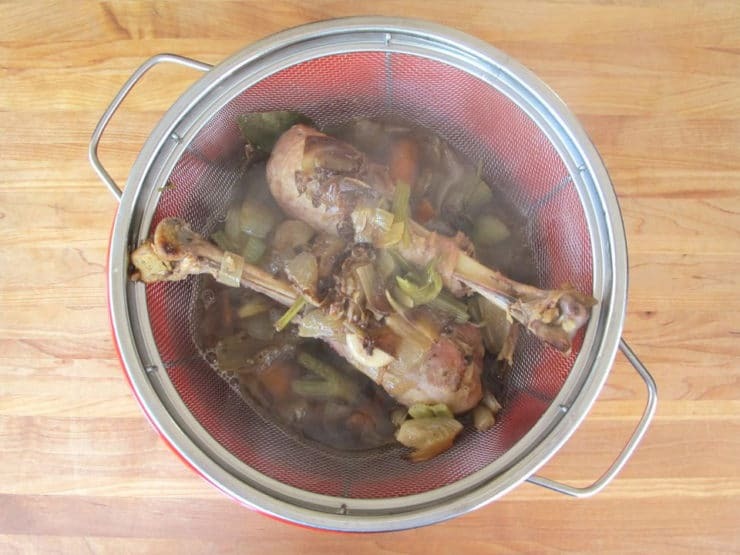 While wearing oven mitts, SLOWLY lower the poultry rack into the deep fryer using the metal lift hook. This process should take at least one full minute. 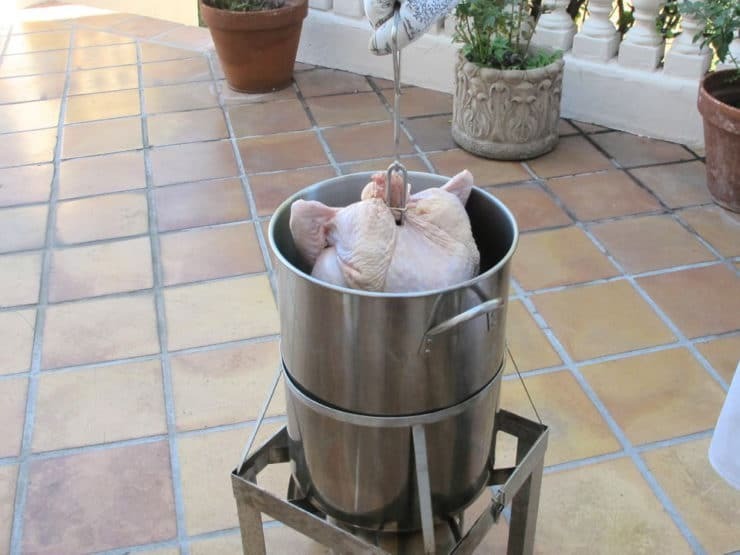 Do not submerge the turkey too quickly or the oil may sputter and boil over. Use extreme caution to avoid getting burned. When you’re ready to check the turkey temperature, turn off the flame and gas. Have a sheet tray nearby. 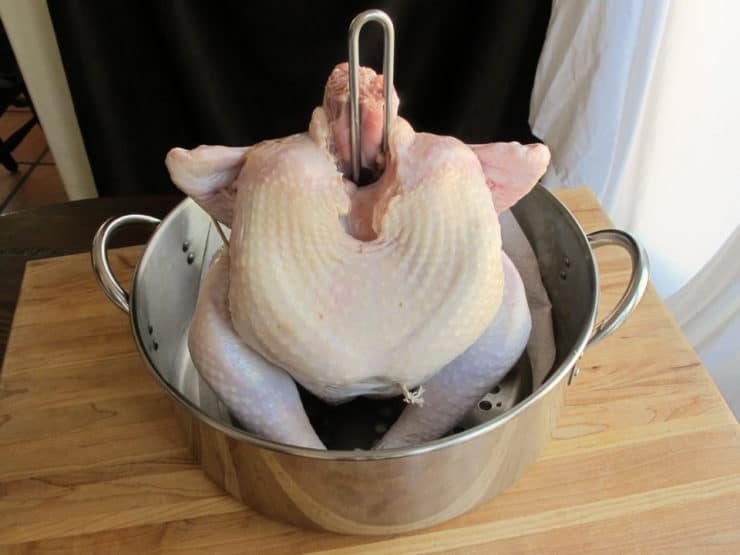 Wearing oven mitts, use the lift hook to very carefully remove the turkey from the hot oil. Place the turkey onto the sheet tray and immediately test the temperature using a probe thermometer inserted into the thickest part of the breast. 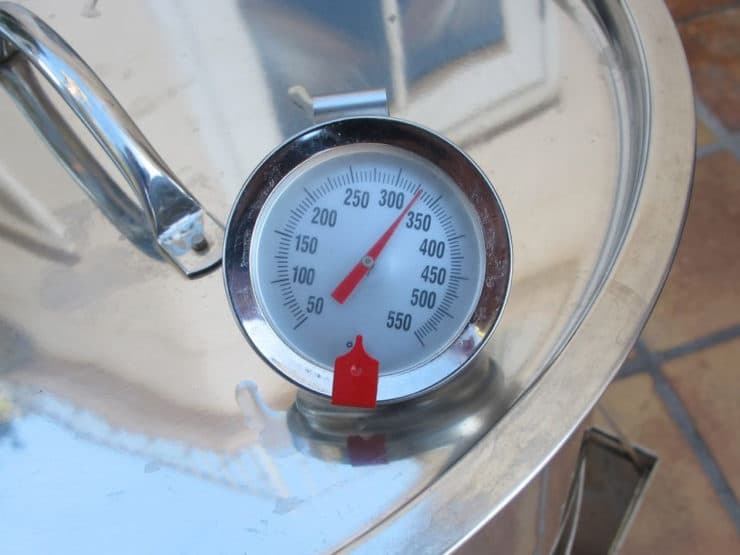 Ideally, your turkey should read 160 degrees when it first comes out of the deep fryer (temp will continue to rise after it is removed from the hot oil). If your turkey does not reach 160 degrees, immediately return it to the hot oil for additional cooking until it comes to temperature. After you take the turkey out, as it rests, the internal temperature will carry over to a temperature that is safe for consumption, which is at least 165 degrees in the innermost part of the thigh and breast. We take it out a few degrees below 165 to avoid having the breast meat getting dry. In all of our tests, the meat temperature continued to rise by 5-10 degrees after removing it from the hot oil. Do not consume your turkey till it reaches 165 degrees. Allow your turkey to rest for at least 20 minutes so the juices can distribute throughout the meat. Carve and serve. Preheat oven to 400 degrees. 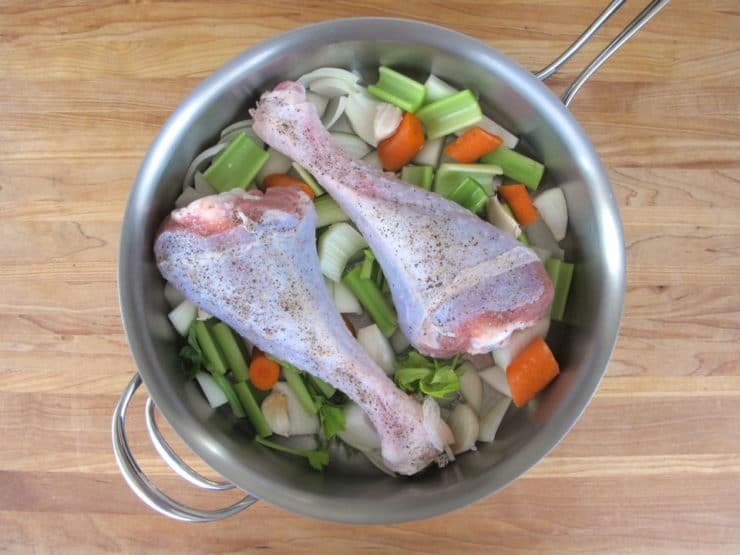 Rinse turkey legs and pat dry, then lightly salt and pepper. 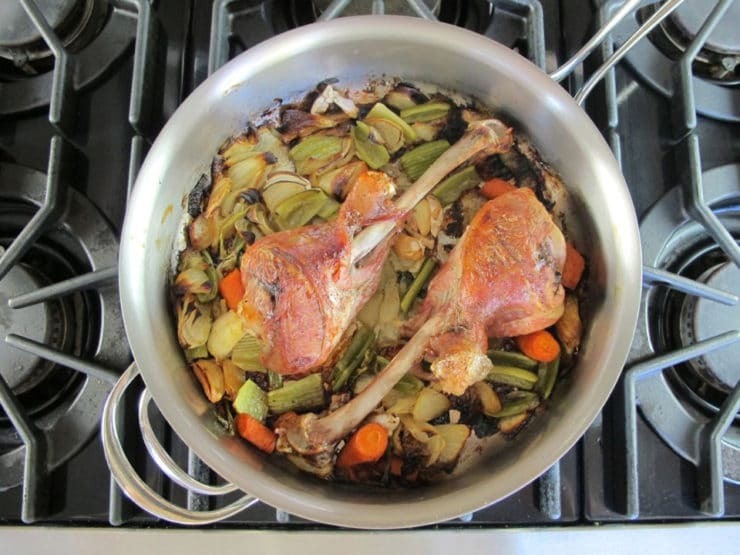 Grease the bottom of an oven-safe braiser, saute pan or roasting pan with olive oil, then add onion, celery, carrots and garlic and top with the turkey legs. Roast in the oven for 1 hour and 30 minutes. 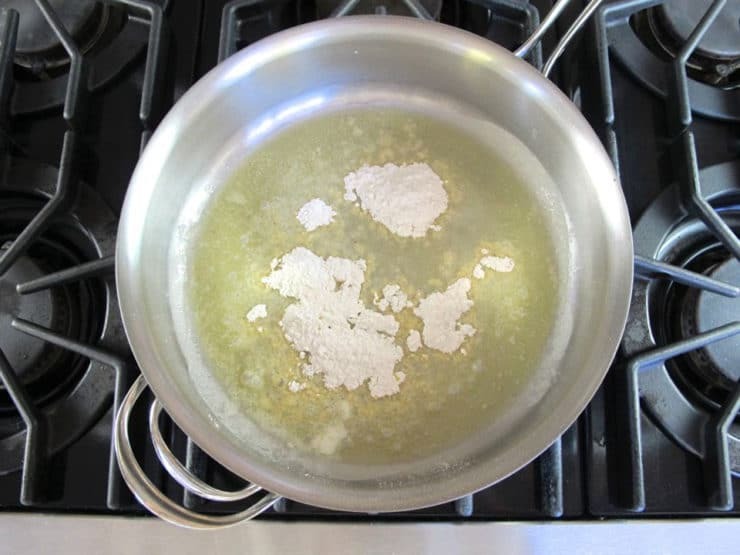 Remove and transfer to stovetop. Add 7 cups water to the pan and bring to a low simmer. 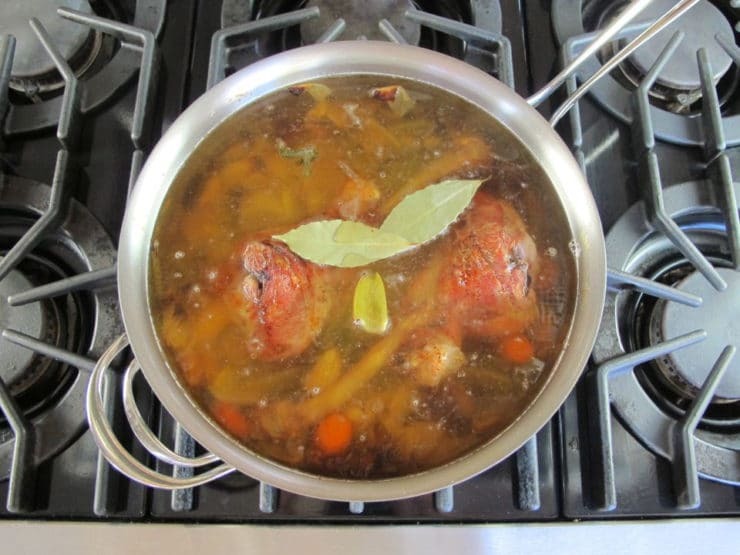 Do not boil or the stock will become cloudy. Cook for 1 hour. Strain stock into a bowl using a mesh strainer. Set aside for use in sriracha gravy. 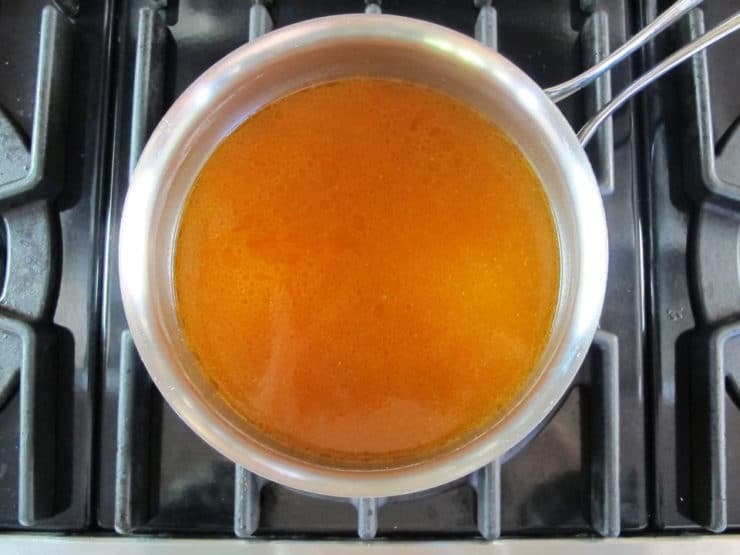 To make sriracha gravy, melt 3 tbsp non-hydrogenated margarine in your clean braiser or roasting pan. Add flour and cook for about 5 minutes, whisking constantly, till the flour mixture turns a light sandy brown color. Pour in stock 1 cup at a time, whisking constantly until thickened. Turn off heat and stir in sriracha, salt and sugar. You should be left with about 4 cups of sriracha gravy. Feel free to adjust the amount of sriracha to the spice level you are comfortable with. If making this gravy a day ahead, let it cool to room temperature, cover with plastic wrap and refrigerate overnight. Reheat before serving, reconstituting with water or low sodium chicken broth till smooth and liquid. 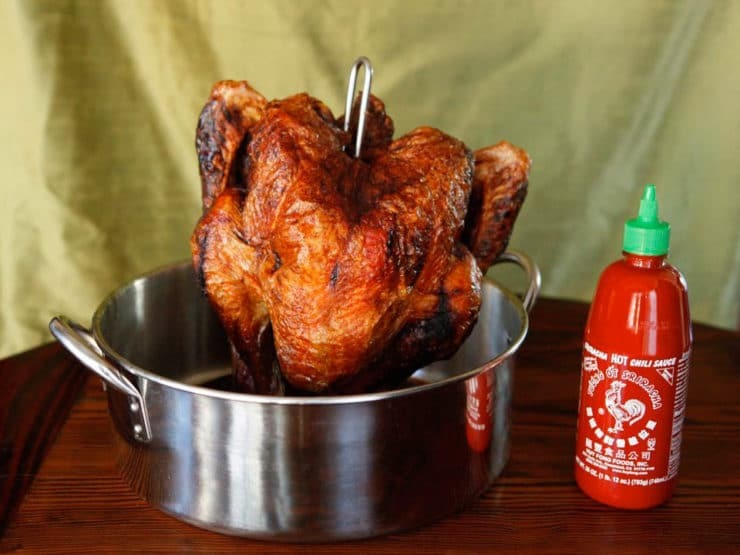 Serve deep fried turkey slices topped with hot sriracha gravy. Can’t wait to try this marinade; indoor turkey fryers are now available – I have used the last two years and it’s fabulous! Holds up to a 20lb turkey – I use it in the garage or enclosed patio (we live in a cold climate) – I watch carefully – never had a problem and turkey always delicious. Great having the ovens freed up for the sides. I made this Turkey yesterday for our Labor Day Picnic, the turkey was by far the best turkey I have ever had, the meat was juicy and moist, the skin perfectly crisp, and the gravy…. please do yourself a favor and take the time to make the sriracha gravy, it was to die for! There was not a scrap of meat left! Thank you for sharing the recipe. Also as a side note, we did not have peanut oil, so I substituted with corn oil and the flavor was still amazing! “Tori’s turkey!” at Thanksgiving! Exceptional recipe! Now a family tradition!! Yay!! 😀 This makes me so happy! is a version of frank’s red hot, called Rajjili. It’s a ginger garlic flavor. I’ve done it – it’s delicious.